The monitoring system works behind the scenes as a second pair of eyes. It looks ahead of you to provide you with alerts in real time. An audible alert through the cabin speakers and a visual message on the windshield are used to let you know that an animal is up ahead. 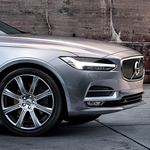 If you don't take action in time, the V90 may apply the brakes automatically. The V90 can also prepare you for the worst-case scenario. If the system detects that a collision is imminent, the driver and front passengers seat belts are tightened for extra protection. This function occurs when you're traveling over 18 MPH.